People ordinarily very resistant to moe have been broken by this girl. Hidamari Sketch is a slice-of-life show with perfectly ordinary events at an Art High School. Sure the girls are all artists, but they're still average/ordinary girls. Yuno is one of the many students who live in the dorm right outside school. At first she was worried she'd be living alone, away from family, but very quickly became friends with 3 other girls. At the end of every episode, she has her trademark bath scene with no real fanservice - artstyle and the fact she pours a coloured powder packet into the bath so you can't see anything. This habit is so strong, even on an evening where she went out to a public bathhouse with everyone, she left the bath to warm up and therefore had to take a second bath since it would have been a waste otherwise. 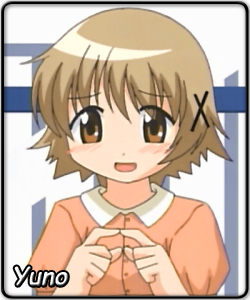 Yuno is ordinary, but a little naive at times, most notably demonstrated when "Hiro-san received a love letter!" was the topic of the day/episode. Yuno squirmed and blushed as she asked: "Kiss? That's when... they put their lips together and... and..." Occasionally, spaces out in class and is part of the collective Tsukomi to Yoshinoya-sensei's boke. The X-shaped hairclips are something she insists on putting on, even at the bathhouse.